Traab Engg India P Ltd are business of simulators and allied accessories for the Army, Navy and Air Force since 10 years. The simulators are manufactured in our state of art manufacturing unit located in Bangalore. 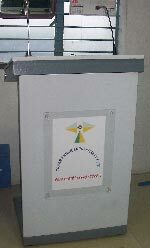 We also manufacture interactive lecture podiums which is of use to class rooms, seminar rooms and auditoriums specially for the Government, Defence and Education segments. Gone are the days with black boards, green boards, chalks, white board and markers…The World has moved towards a technology, where you just walk in with a Pen drive to your conference room/training room/board room/classroom and show your skills in an impressive way, save and record your session for future reference…get complete audience control through a audio visual presentation/training/lecturing…operate entire computer application on the board…browse, download, send mails, take print out….what not? You are hungry for the new technology, irrespective of the cost and we are here to help you to adopt and serve the latest and best technolgy…This Product will give you a display with multiple inputs..you can write on it..you can annotate and make changes in your presentations…No need of projector..use it as a TV, use it as a interactive display unit, use it as a board…what else you want? It is basically designed for 24/7 critical operation used for monitoring operations, build in signal processing with 9 windows on single screen. Our L.C.Ds are not designed for long hours & continues operations. This is a perfect solution for security monitoring, with Proven reliable DLP display technology in XGA & SXGA+. It has dual lamp system, if one bulb fuses, second bulb will start…use it for uninterrupted data monitoring or any other display. Electromagnetic Panel Type with XGA & SXGA Resolution supports minimum System requirement. No projector replaces large screen Whiteboard, annotate over program / application powerful software, easy to learn & use. Have full control on audience/students by facing them and write on the panel, which will get projected behind you. A powerful and cost effective wireless audience system uses range from traditional classroom to group meeting where instant feedback is critical. It integrates into MS PowerPoint making both easy learning & use by eliciting, encouraging audience participation & real-time feedback electronically collected thru a simple CLICK of a button. Your existing T.F.T / L.C.Ds can be converted in Interactive L.C.Ds by fixing an Over-Lay on the hardware. It uses the membrane technology where your fingers can be used to mark on the L.C.Ds.With USB Plug & play, four point calibrations, over 4 million touch points, multitouch capable, cost-effective & also scales effectively to allow the touch enablement of very large PLASMA & LCD displays. This is one of the basic need for any meetings/conference/classes…. we don’t just sell any projectors…we give you the best brand/model based on your usage…we ensure that you pay only for what you need…solution based. We confidently say that we are one of the best solution providers for your requirements. We provide you the best quality of screens, white boards and signages at much competitive price. We take Annual Maintenance Contract for Projectors of any brand. We do the complete installation with suitable mounting kit and quality cables which help you for a hassle free presentation. We provide complete solutions for Modernization of Ops room, Conference room, Training room and Board rooms. A unique product with special features for ease of use.